Hello, everybody! Once again, we’re writing this from Huntsville, Alabama where we’re visiting our twin grandbabies, Jackson & Julie, 5 1/2 months old already & adorable, of course! Tomorrow (April 13th) we’ll be playing at BANDITO SOUTHSIDE again. 2013 marks our 30th year of playing music together, and it has been a great year so far. Liz & I flew to PARIS, FRANCE to perform at the 15th INTERNATIONAL BOOGIE ET BLUES FESTIVAL at Theatre Columbier on Jan. 18th & 19th. The two-night festival was sold-out both nights, despite Paris having its worst snowstorm in years! We shared the stage with ARTHUR MIGLIAZZA (from Seattle, WA), CHRIS WATSON & his band (from Belgium), and the DENIS MAZHUKOV Band (from Moscow), and we played in various combinations with the other musicians in addition to our own sets. Liz & I had a fantastic time and, despite the snowstorm, we were able to do some sightseeing in downtown Paris; I enjoyed an 18-inch hotdog wrapped in a loaf of French bread beneath the Eiffel Tower- the best hot dog I’ve ever had! Two days after returning to St. Pete, Liz & I opened for the LAUREN MITCHELL BAND at the Palladium Theatre on January 25th. This was Lauren’s CD Release Party, and we were playing to her enthusiastic (and sold-out) audience in the Side Door. Lauren Mitchell (originally from Ohio) and her band are an exceptionally talented & entertaining group- go out & give them a listen if you get the chance. On February 23rd, we hosted our 4TH ANNUAL BOOGIE WOOGIE/BLUES PIANO STOMP at the Palladium Theatre. This show was SOLD OUT for the first time (800+ tickets sold), and it was a huge success. This year, Liz & I were joined onstage by CARL SONNY LEYLAND (from England & California), DARYL DAVIS (from Maryland), and BOB SEELEY (Michigan), the world’s premier boogie woogie master & four-year-veteran of the Stomp. The show was filmed & can now be seen on YouTube (keywords: boogie woogie Palladium). WEDU-PBS TV (Tampa) sent a film crew to our show at JAXSONS ON THE BOULEVARD (St. Pete Beach) on March 22nd for a featured segment on their ArtsPlus program, to be aired in Tampa Bay June 11 & nationally after that. Liz was also interviewed & filmed the following week for this show. Watch this space & your email for more info. We have 2 new items for sale- please visit our STORE page & merch table at shows. Congrats & thanks to these 2012 Frequent Fan winners: 1. Judy R. (attended 40+ shows! ); 2. Teresa W., 3. Priscilla H., 4. Art O. (all attended 30+ shows! ); Dan H., Diann F., Judi L., Barry S., Terry G., Barry H., Wayne K., (20+ shows each); Linda M., Harriett S., Diane G., Robert F. (10+ shows each). Loyal fans like these contribute greatly to our success & we invite you to join them in the crowd soon, & ask for your free Frequent Fan card while there. This week marks the one-year anniversary of our new website! Our thanks to our webmaster & friend MIKE CONATY at Brunswick Media. If you haven’t received an email from us in the past year, please sign up (again) for our email list on our HOME page. Hello from Huntsville, Alabama where we’ll play BANDITO SOUTHSIDE this Fri. Nov. 30! We arrived here last Friday night & were thrilled to finally meet our new twin grandbabies Jackson Andrew & Julie Nikole, born Oct. 21. They are real dolls & even cuter in person than the photos we’d seen! Congrats to Drew & Kristen!! We sure did enjoy the rest of our August tour & the Parkersburg & Marietta shows were a fine nostalgic treat seeing all our home folks, including family + several that I went to school with but hadn’t seen in many years! Longtime fan Dave Garrett from Cambridge/Athens came for his birthday, then sadly passed away in October. We also lost another longtime fan, Joe Davis from Belpre this year, & our Aunt Doris Seibert from Cleveland in Sept. She was the sweetest person & always supported our music, as did Joe & Dave. We’ll miss them all, especially when we play Ohio. Doc had cataract surgery Sept. 25 & is seeing much better. Took some time off, then played a nice new venue in St. Pete Beach, BOULEVARD GRILLE for 4 Fridays. More upcoming gigs there & more places…hope you’ll join us! We also shared a concert at the SIDE DOOR in St. Pete called BICOASTAL BOOGIE WOOGIE GALS with San Francisco’s CAROLINE DAHL on Nov. 15, & a Swingtime dance at the GULFPORT CASINO with the ST. PETE BLUES ALLSTARS on Nov. 21, then left for Huntsville the next day (Thanksgiving)- whew! We’re excited to play PARIS, FRANCE Jan. 18 & 19 at LE COLOMBIER- FESTIVAL BLUES ET BOOGIE- please tell your European friends! 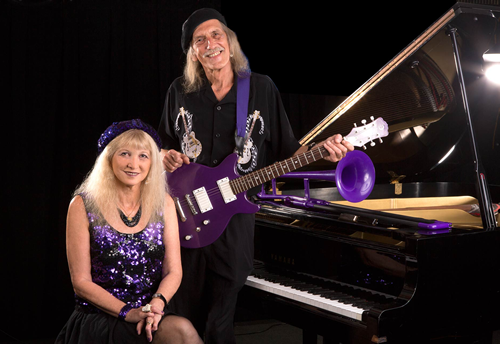 And our next BOOGIE WOOGIE/BLUES PIANO STOMP will be Feb. 23 at the PALLADIUM THEATRE in St. Pete- save the date! It’s hard to believe that the Holidays are here again! If you’re looking for unique gifts, please visit our STORE page. The Tshirts are sold out, & we have only 7 Tank Tops left, so hurry if you’d like one. Our new piano/guitar lapel pins with my art design are now available at shows, & from the website soon. Diamond Teeth Mary CD’s are for sale at the Red Caboose in Huntington, WV, and our CD’s are now for sale at a cool St. Pete shop: Main House Antique Center. It sure has been a busy, good year & we thank each of you for your love & support! Just a quick note from the road in Ohio…what a whirlwind the first 2 weeks have been! Thanks to all who came to our St. Pete Blues Allstars sold-out show at the Palladium Side Door July 13- what a night! And our last St. Pete gig at Beak’s Old Florida on July 21 was really special too. We hit the road July 24 & played our first 2 tour gigs in Indianapolis at Tastings & Slippery Noodle Inn. Indy is such a cool city, & it was great to see our fans & friends there. Stayed a few days with the Grusecks in KY, then shared 2 gigs this past week with Cincinnati’s own piano star Ricky Nye- proving once again that “Piano is Fun!” Also heard Ricky at Lebanon Blues Fest Saturday. Spent Sunday visiting with all 3 of my sisters here in Lebanon, OH. This week we’ll be resting & getting ready for this weekend’s Cincy Blues Festival & related events. 2012 has been a good and hectic year so far, with new steady gigs including 8th AVENUE PUB in Safety Harbor, ON THE ROCKS in Indian Rocks Beach, and the first club in years with a grand piano- SEMERARO’S ITALIAN CAFE & PIANO BAR in St. Pete. In addition to many shows in March & April, we were busy working behind the scenes on this new website. We’re thrilled to have MIKE CONATY of Brunswick Media Services in New Jersey as our new webmaster. Mike is a longtime fan, friend, radio DJ & drummer who contributed handclaps on our BLUE ILLUSION album, and also gave me the stage name of “DR. BLUES” way back in the 1980’s. Mike has worked tirelessly and patiently with us in redesigning these pages. Many thanks to our original webmaster, PETER FLEMING, and also BILL BOIS, for their expertise over the years. After returning from our Summer Tour, we played the BOOGIE WOOGIE PIANO FESTIVAL at Satchmo in Ft. Lauderdale September 11th, hosted by PIANO BOB. What fun to share the bill with the likes of DAVID MAXWELL, VICTOR WAINWRIGHT, BARRY CUDA and SHRIMP CITY SLIM. On September 25th, we performed at SKIPPER’S in Tampa with ST. PETE BLUES ALLSTARS and others for a tribute to our friend & harmonica great ROCK BOTTOM, marking the 10th anniversary of his passing. We appeared live on WMNF 88.5FM radio in Tampa September 23rd on Bill Dudley’s “Live Music Showcase” with Rock’s colleagues KIM HARPO, TOMMY BELL, and TBONE HAMILTON. We returned to WMNF on January 23rd, 2012 to chat with LARRY LISK on his “Mo Blues Monday” show about our upcoming boogie woogie concert. Our 3rd annual BOOGIE WOOGIE/BLUES PIANO STOMP at the PALLADIUM THEATRE in St. Pete on January 28th was another huge success & magical evening! Liz & I started out the show, followed by Detroit’s boogie woogie master BOB SEELEY, Indiana’s piano favorite CRAIG BRENNER, and Canada’s 35-year-old sensation MICHAEL KAESHAMMER. Each set included a duet with another pianist, and the night finished with an incendiary finale by all the players together on the 2 grand pianos. Liz’s song “The Same For You” from our SIX FINGERS BOOGIE CD was #11 song of 2011 on MUSICTAMPABAY internet radio. Her piano playing was featured on RANDY HOCK’S #1 song of 2011, “OK Just Ain’t Good Enough.” Thanks to everyone who voted for these songs! Congrats and thanks to all our Frequent Fan winners of 2011: #1 Judy R. (40+ gigs attended! ); #2 Dan H.; followed by Terry G., Judi L., Barry S., Linda M., Wayne K., Priscilla H., Diann F., Art O., Hildegarde & Ralph N., Barry H., Jim I., Marlie & Rick, Lisa B., Teresa W., and Marlyn. Please join these music lovers at a gig soon! Check our SHOWS page for Summer Tour dates booked so far. If you’d like us to play your town, let us know of any good gigs or festivals nearby, and refer the venue to this website. We also do house concerts and private parties- please email us for info.